Stores data from one execution to the next when enable? is set to TRUE. By default, the node stores data from only the previous execution. However, you can configure the node to store n samples of data by delaying the output of the node for multiple executions. If you increase Delay to more than one execution, the node outputs only the Initial Value(s) until the delay you specify is complete. The node then begins to output the stored values in subsequent order. The number on the node represents the number of delays you specify. The data to be stored and sent to the next execution or iteration. Initial value for the first execution or loop iteration. If you do not wire a value to initial value, the node uses the default value for the data type. A Boolean that determines whether the feedback loop is enabled. TRUE The node stores data from one execution or loop iteration to the next. 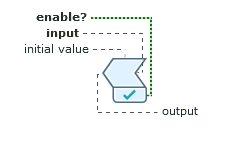 FALSE The node continues to output the last value from the previous execution or iteration until enable? is set to TRUE. The data stored from the previous execution or iteration. You can use the Feedback Node to resolve illegal cycle errors. Insert a Feedback Node into the cycle to resolve the error.